Mr. McMahon's wish will become reality! No more troll or John Cena at SummerSlam!! 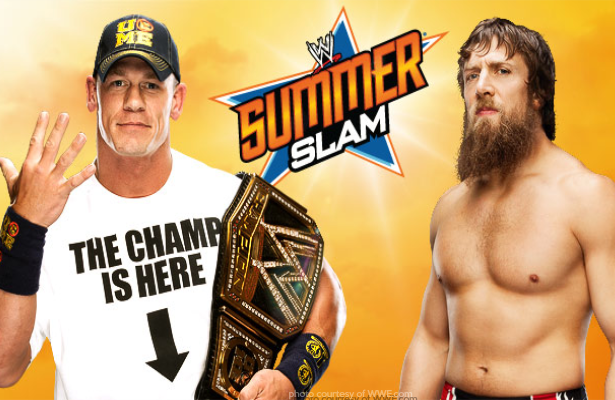 Last night on RAW (July 29, 2013), Vince McMahon said he didn't want John Cena and Daniel Bryan to be the champion at SummerSlam. He wants them to evaporate. He wants to see John Cena lose his title since Cena, in his oponion, think he is more important than him. He neither wants to see the undersized troll Daniel Bryan become the champion. As he said, Daniel Bryan as WWE Champion would be the worst embarrassement possible. Mr. McMahon also mentioned that both lack 'ruthless aggression'. Knowing that, what are Mr. McMahon's choice now? He said he wants someone as Triple H to be the champion, but 20 to 23 years younger. Triple H just turned 44, which give us a 21 to 24 years old canditate... Problem! Problem! There isn't any 20-something years main eventer in the WWE Universe. Those 20-something main eventer of the past (John Cena, Randy Orton, Brock Lesnar, The Rock) are all 30 by now. There is not wonder kid anymore in here. But about a not too old 33 years old forever main eventer with plenty of 'ruthless aggression'? What about the Viper, the Apex Predator himself!! Mr. Money In The Bank Randy Orton. The scenario is clear. After a hard-fought WWE championship match, the winner, either Daniel Bryan or John Cena (most likely Daniel Bryan) will be an easy prey for the Apex Predator. SummerSlam 2013 will be the perfect to cash-in the Money In The Bank for Randy Orton. At SummerSlam 2013, Randy Orton will be a 7 times WWE champion!!! "The Apex Predator" Randy Orton certainly doesn't lack 'ruthless aggression'. Yes, that's the only guy that Mr. McMahon wants to see as his WWE Champion!